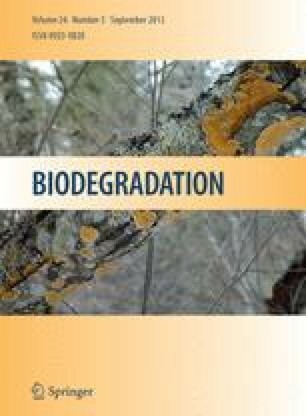 The potential toxicity of thes-triazine herbicide atrazine motivates continuous bioremediation-directed research. Several indigenous soilatrazine-catabolizing microbialassociations and monocultures have been enriched/isolated from compromised sites. Of these, Pseudomonas sp. strain ADP has become a reference strain and has been used to elucidate sequences of the catabolic enzymes atzA, atzB, atzCand atzD involvedin one aerobic degradation pathway and develop probes for the genes which encode these enzymes. Despite this, hitherto unknown or novel microorganisms, with unique sequences and different enzyme-mediated operative pathways, warrant continued investigations for effective site bioremediation. Also, the sustained effectiveness of natural attenuation must be demonstrated continually so regular site evaluations and results analyses, despite the limitations of chemical extraction methodologies, are crucial practices. For both directed and intrinsic bioremediation monitoring, traditional microbial association studies must be complemented by more advanced physiological and molecular approaches. The occurrence of catabolic plasmids, in particular, should be probed with DNA hybridization techniques. Also, PCR-DGGEand subsequent new sequenceelucidation should be used prior to developing new primers for DNA sequences encoding novel catabolic enzymes, and for hybridization probe development, to establish the degradative potential of a compromised site, or adoption of FISH to, for example, monitor bioaugmented remediation.